Arthur Wheater was born in Yorkshire on August 2nd 1892. Anne Hickey was born in Aherla County Cork on April 7th 1898. They met in Dublin, in troubled times, an English soldier and an Irish girl, and married in August 1923. Their first child, Arthur, was born on August 11th 1924, and in 1925 they all went off to India for five years with the Tank Corps. They all returned in March 1930, and lived at 32 Pinehurst Barracks, Farnborough, a house still standing in 2003. On February 19th 1932, at the age of seven, Arthur died during a routine tonsils operation. On March 6th 1933 I was born, to parents aged 40 and 35, and in 1937 was joined by my brother Graham, the last child of Arthur and Anne, still in the same house. On my fifth birthday I was struck by measles, and wore rough dark grey gloves to avoid seeing the spots. I was thrown, on learning to read, by the word 'THE'. Just as I'd sorted out letters and sounds, here was this new puzzle. Bunty Wapshot was run over and killed during our	time in Farnborough, which ended in 1939 when Dad retired from the Army and we moved to 101 Oxford Road, Wokingham, which was also still standing in 2007. He worked as an instructor at the Army Apprentices School at Arborfield, now closed, until 1960. I was in Canada then, but Gray tells me that Dad concealed the fact of his (already late) retirement until Mam was making his sandwiches for work after the Christmas holiday. This caused a crisis, as the house was rented, and the rent (to 'Old Lunn') was increasing. It was resolved by them both going into service (aged 68 and 62) with the Campbells (Colonel and 'Nitty') at Westwood, Lower Bourne, Farnham, which I cannot now find. One year later there was enough money to buy a house in Yorkshire, where they moved in 1961. Nitty (as Mam always called Mrs Campbell) was of an important local family, the Andersons, who had at one time owned Waverley Abbey House. She became very attached to Mam (as she was to the sauce) and suggested Mam coming to her "if anything happened to Mr Wheater". Westwood Country House B&B, Pine Ridge Drive, Lower Bourne, Nr Farnham, Surrey, GU10 3JP. 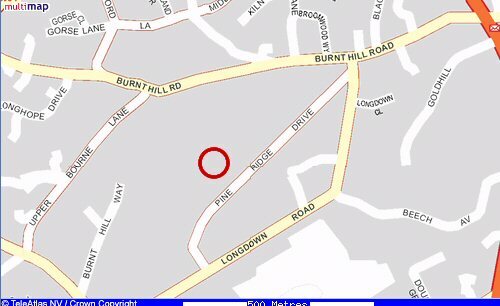 Telephone (01252) 721664 Grid Ref:SU839444. Back to 1939. In Wokingham I went to St Paul's School for four years, until 1943. Mr Bagley (Mr Aggly Bagley) was the head, assisted by Mr Wilkinson. Mrs Scott was my form mistress at one time, and presented me with a copy of 'Out With Romany Once More' as a prize for coming 2nd out of 42. Had it not been for that Joan Brooker I should have got the proper prize. Still, how thoughtful of the formidable Mrs Scott. 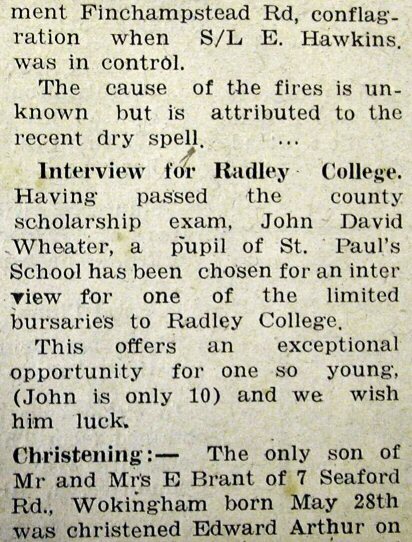 I turned out to be a clever child, and in fact the cleverest boy in Berkshire in the public exam which I took early, aged 10, in 1943 (See the Wokingham Times & Weekly News for July 2nd 1943). The prize for being the CB in B was a place at a posh school. "Perhaps the greatest cruelty one can inflict on a child is to send it to school among children richer than itself. A child conscious of poverty will suffer snobbish agonies such as a grown-up person can scarcely even imagine." The result was that I started at boarding school in 1943, age 10. I was a boarder for the next seven years. What about the holidays? I still saw the Fulbrooks, David was my particular friend, but it wasn't the same. They were all staggered when I came back from my first term, and thought I was putting on my posh voice. One holiday I went to stay with Meek, near Esher; I failed to get off at their station, Claygate, and saw Meek & his father looking puzzled on the platform. But I got off & came back, & they were still there. This must have been 1944, as we slept in the shelter against the doodlebugs, which we heard from time to time. In the summer we went either to Ireland or Yorkshire, to family. Once going to Ireland I saw a German aeroplane come over the ship (The Innisfallen I expect, Fishguard to Cork), and the sailors manned & pointed their gun, but no hostilities occurred. It was curious being in Ireland, as you could just buy sweets in the shop. Not like here, where Meek & I made ourselves ill with laxative chocolate & gum you could buy in the chemist. The Irish used to send us butter, and a goose at Christmas; Mam used to send tea, which they couldn't get, concealed in newspapers.